As I work towards getting my new game Word Monsters! published on the various mobile app stores, I'm mulling over the decision I made to go with Unity for this game. Update 2: I contacted Unity's sales manager in Australia for clarification and there are a couple of things that makes this picture better than the scary thing it seems at first blush. If you have questions, contact them via the Unity website: they're very helpful! (Thanks Patrick). Also, I should clarify that for hobbyists who NEVER really plan to make a living out of Unity games then the issues here may also not really be a problem. If like me you're a serious indie developer who spends their days writing games and has to make a living out of it, especially if you do so through a Pty Ltd company then READ THE EULA and inform yourself. You also might want to consider getting your lawyer to look at it: I am not a lawyer and this is not legal advice. Its more and more obvious to me that the naive idea that a lot of developers go with around Unity - that its "free" - is completely wrong, and a bit dangerous. For me the cost is around $6k by the time I convert into my local currency. Let's break this down. First let's look at a couple of non-monetary costs. I have noticed that load times are longer than native, and by an amount that might cause some players to drop off. Also app bundle sizes are large: I'm struggling to get the size down. I'm sure there's lots of things I can do. I believe in "premature optimisation is bad" and as a result I'm looking to these things as I get closer to publishing, but its a real issue. This could translate into a monetary cost if potential players are put off from the game - some players just delete a game if it takes ages to download or start-up. Another cost: calling out to iOS platforms like Social and Store is a pain from Unity. Same for Android API's. You need to use various wonky plugins from 3rd parties, and those might not play well with your existing plugins, and can add to your load time/app size headaches. But the elephant in the room is that people treat Unity as "Free" - its not. I'm not saying its not worth what they're asking for it: around $6k AUD. Its got amazing power and is a very feature-ful product. Compared to other large software suites like the various 3D editors, like Adobe's products and other creative industry software its reasonably priced. But wait, you say $6,000? Unity Pro is only $1500, and you can pay a subscription of only $75 a month! Well, it is $0, as long as you earn less that $100,000 - and wouldn't that be a nice problem to have. Yeah, amirite? Grin! Not so fast. OK - let's say I want to try to eke out a living making games, and I think "OK, lets meet Unity's conditions for the Personal Edition". To do that I have to make less than $100,000 in a given financial year, so July 2014 - June 2015 for example. But that is gross revenue, across all the Unity titles I have in the store, for my entity. In my case the "entity" is Smithsoft, my company. The $100,000 is gross revenue. Go and read the licensing conditions. They're well written and worth a read. So Unity is coming in to check on you before you get to deduct any of your costs. How Much Can I Make Before Paying for Unity? UPDATE 1: After a discussion with some game dev colleagues this first paragraph looks to be wrong. If you don't receive the money in your bank account then it doesn't count as revenue. So if the App Store takes it cut before passing on the rest to you, then "revenue" for the purposes of Unity's $100k calculation may be more forgiving. My advice: check with your lawyer or accountant first. UPDATE 2: The following paragraphs in this section have been reworded after clarification from Unity that "revenue" does mean money remitted to your bank account from, for example, the App Store. But while you do get to effectively deduct App Store costs, you don't get to factor in all the other costs of developing the game. Let's say that in a financial year after Apple takes its cut I get a smidgin under the Unity cut-off of $100,000USD as revenue in my bank account from sales of my premium iOS game. That's around $130k AUD. anything else that it cost me to build my game. There's a ton of hidden costs. For some of us we do our own coding, art and so on. Great, right - don't need no stinking contract developers. But doing it yourself doesn't mean its free, as our time has value. I could be working elsewhere as a Software Engineer at whatever the going rate is. If instead you're working full-time for 6 months on no pay, that has a cost. If you don't know how much it really costs to make games do some research, its not cheap. Let's say its a casual game with one person full-time, and a few casual contractors bought in as needed to do art, etc, and took 6 months from go to whoa. Total cost to make the game, conservatively $AUD80k. Here at River City Labs over the past 3 years I have made my own game, and worked alongside teams of developers working on at least a dozen other titles to go to market. I think $AUD80k is pretty fair on average for a casual game over 6 months right now. Now out of the $130k I'm left with $AUD50,000 in my pocket - Software Engineers make twice that in a regular paying job. And out of that I have to pay the Australian Tax Office its cut. I'm not saying its a bad lurk, and it would be great to be that successful. All I'm saying is that "making $100,000 a year" is not a path to fame and fortune that it sounds like. By the time you factor in the costs of making the game its barely a living wage if you are trying to make a living so you can actually be a full-time game developer. What I'm saying is that that figure is out of your gross revenue. Do your sums first before you plan to "be successful" by sneaking in under the Unity revenue watershed. If you want to take home enough money to actually pay rent, and put food on your table at home, then your gross revenue is going to be more like $200k AUD minimum so that by the time you pay your game dev bills you actually have something left to pay for food. After Flappy Bird and A Dark Room it seems like you can make some game on zero budget but make out like a bandit on the App Store. For every Flappy Bird there's millions of low-budget, low-quality games on the stores that languish and never make a cent. You'd be better off packing grocery shelves for that time, and spending the money on a Lotto ticket for the chance you have to get paid that way. The reality is that games with modest production values and good development teams behind them are the ones that succeed, and those games cost to build. Or, you can make more than $100k revenue, and go and buy Unity Pro. I guess you can do that after you make the $100k threshold right? Be careful - you can't use non-Pro stuff alongside the Pro stuff. There's caveats. Read the license. But anyway, we're assuming we're going to buy it. Update 2: I contacted the Unity guys and they clarified that the intent of the "no mixing Pro and non-Pro" clause is just to make sure that everyone on the team doing development does have the Pro license. You are totally fine to switch to Pro later in your games cycle. Unity Android Pro - $US1500. And the costs add to a total of $4500 US - which is $5857.35 in Australian dollars. That's the lion's share of $6k depending on exchange rate. Before you click that buy button check what your local spend is going to convert to. If I buy Unity 5 right now, for around $US4.5k, I get to keep and use it for ever. Usually that's what buy means. Nice. If I'm grossing $US100k then that $US4,500 is not so bad. But when Unity 6 comes along, all bets are off and I have to buy it all over again. Note that the cost to upgrade from a previous version is cheaper. But you do have to get your credit card out again. Maybe the subscription option is looking good? If I go the rental route I pay $75 a month, for each of the 3 items, and that is a total of $225 a month, and when Unity 6 comes out I just start subscribing to that. Great. And as soon as I stop paying I don't have Unity Pro any more. Its like a spring-loaded trap if you don't set up your payments right. I don't like that. I'd prefer to buy up front and know I'm clear, but its a pain that I have to re-buy if I want the new hotness in later releases. Is it really a trap? In fact is it really so bad, if I don't get Pro and kind of fudge around that fact? Nudge, nudge, wink, wink. So how does Unity know that you're making more than $100,000 from your Unity games? By having monitoring code in your games. 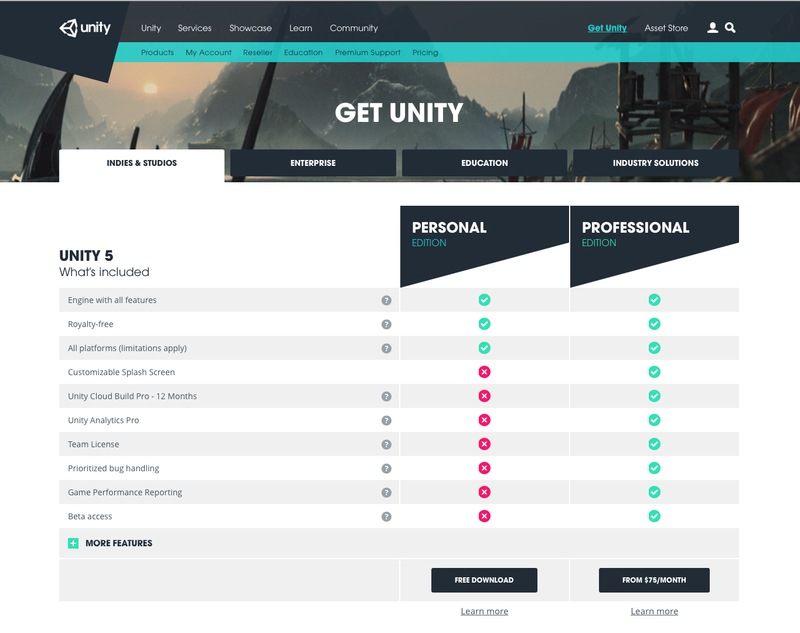 So how scary could Unity's lawyers really be? I don't know - and I don't want to find out. The prospect of even some sort of shadow coming down over my games which are published on the Play Store or App Store is just terrifying. I love being a game developer. Unity's lawyers contact the App & Play Stores and say there's an issue with my games - what happens to my account on those stores? That could be game development over unless I change my name, move countries type stuff. Not to mention that being non-compliant with licensing means that if I decide to sell my IP, or my company which holds the games, or seek investment based on a stake in my company, then due diligence is going to close over my limbs like a bear-trap. Here's me waiting for my nice check for Activision buying my company, and instead I get served a writ for failing to own everything I said I owned. If you work for a company and expose your employer to due diligence issues you could be in trouble personally, depending on what your employment contract says, and what kind of shares you have. If you've never heard of due diligence before, go and Google it - know about it before it bites you. As a little guy, you might think "its no problem - none of that could ever happen to me". Maybe. If you want to stay a little guy. Maybe Dong Nguyen, the author of Flappy Bird thought like that. Or insert any other game dev success story. And success only to have it all taken away by some legal nightmare is almost worse than no success at all, in my view - you might lose your reputation as well. All I'm saying is if you actually want to succeed in game development you don't just brush aside legal concerns about licensing and think you'll solve them down the track. So coming back full-circle - what are the options then? Do we have to pay thousands for Unity if we want to go to iOS and Android? Update 2: Its possible to wait until some later time in your games development cycle, such as when it looks like you will make over $100,000USD and then buy Unity Pro. The fact that you can still pocket say $50k for a years revenue without triggering the "Unity Pro" condition makes it viable to take the risk. But in my opinion unless you're a hobbyist with no serious intent to try to be a full-time indie game developer, you REALLY want to read up all the Unity licensing, get advice, make sure you budget for that $6000 spend and be ready with your credit card for that day. I'm wondering if it makes more sense to ship the iOS game using native frameworks like Sprite Kit. If it makes any money on iOS, take the $6000 you saved by not buying Unity and get someone on UpWork to build the Android port, using for example Cocos2D-X or libGDX. In the end the goals & drivers you might have, including targeted platforms, existing team skill-sets and so on are what dictates what you choose. Unity is definitely worth the money, but just remember - its not free, so don't decide to go for Unity thinking its free.